We all know that playing roulette can be a lot of fun, but as most things, once you’ve done them enough times, it can get a bit bland. The same can be said for roulette. Below we will be going over 7 different variations of roulette that you might not have known existed, and what makes them special. Essentially in Alphabetic Roulette, they replace the numbers that you usually see, with letters both on the wheel and table. In this version he/she will place their bet on the individual letters, 2 letters, 3 letters, or 4 letters. They can also choose to place their bet on certain words such as P,A,R,T,Y, or I. Just like traditional roulette they do have the option to place their bet on certain colors, or on a column or a dozens bet. House has a 4% edge in Alphabetic Roulette no matter what bet he/she places. A simpler variation that enables an optional side bet on their lucky numbers. If the number ends up hitting twice in a row, they win 1200 to 1 on their bet. Ready to really shake things up? This variation adds an entire new wheel to the game. One wheel sits in side the other. The ball sits in between the two wheels, resulting in 2 winning numbers per spin. They are welcome to bet on either the outer wheel numbers, or the inner wheel numbers, or both. Still want to shake things up? How about instead of two wheels, we have two balls? While it is very similar to traditional roulette, if he/she places an outside bet, both balls have to win in order for them to be a winner. For inside bets, either ball can count as a win. Both balls land on an inside bet, the payout will double. Both balls landing in the same numbered slot will get the player a “Double Ball Jackpot”. With this game he/she will get an optional side bet on the 11 prime numbers on the wheel. The bet will pay out depending on how many times a prime number appears in a row. Land a number that isn’t prime, and the side bet is lost. 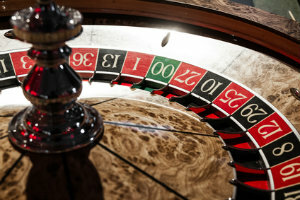 Just like traditional roulette, however the chips are not placed on a table, they are instead placed using an electronic interface. While it can be really fun for some players, it doesn’t quite have that roulette feel that the original game has.